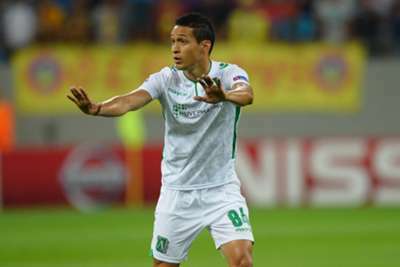 Ludogorets midfielder Marcelinho sees no reason why his team cannot cause a huge surprise and reach the UEFA Champions League last 16. The Bulgarians claimed a shock 1-0 win over a 10-man Basel on Wednesday, joining the Swiss outfit and Liverpool on three points in Group B.
Marcelinho said his team needed to believe they could reach the round of 16 after their first ever Champions League win. “We deserved the win, we were the better team over 90 minutes. We created a lot of good chances but the ball wouldn’t go in for a long, long time,” the Brazilian said. “In the end it did and we achieved this historic win. It was historic for our small club, for our fantastic fans at the stadium and for all Bulgarians. “I’m very happy I was on the pitch and now we are all up for more. Serey Die saw red for Basel in the 18th minute but Ludogorets had to wait until additional time to get a winner through Yordan Minev. Ludogorets coach Georgi Dermendzhiev was proud of his team and said the trip to Switzerland on November 4 would be crucial. “I am happy for the team, for the club, for the players – they proved what they are capable of. Basel are a very good team and we won,” he said. “Even with 10 men Basel played extremely well. “It is nice to score late on. We did it against Steaua in the play-offs and now again. We dominated the second half but sometimes you have to wait.